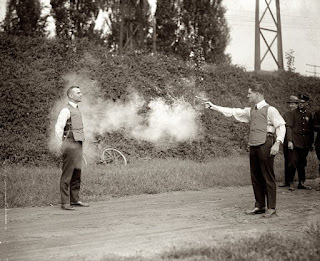 So we just finished paying our taxes, and sort of like the two guys in this 1923 photo testing bullet-proof vests on each other, we wondered — why the hell do we Americans inflict such dangerous pain upon ourselves? To clarify: If someone pitched you a business model where millions of people voluntarily participated in half-day math sessions each year on complex forms to send you a big check in exchange for services they don’t see or understand, would you think anyone would participate? The IRS lesson for marketers is compliance: You can increase sales and profits from customers if you move them from one-off transactions to an ongoing purchasing relationship. And that requires customers to comply. Let us explain. Part of deriving value from consumers goes beyond “acquiring” them — the focus of so much advertising — to engaging them in some meaningful way to extend the profit and relationship. Subscription models are a classic example, in which a company or publication signs a customer up, and then works to extend the relationship for as long as possible. In the best case, subscription models increase the value exchange for both suppliers and consumers. The marketing organization increases sales at minimal incremental cost. Customers can fall asleep and still receive service. Brilliant. So what is compliance? Customers have to agree to continue to give you their attention, or their wallets, or their annual tax returns. The intriguing thing is consumers, over time, become creatures of habit and will continue relationships they may not like, or may not find beneficial. Many, many businesses thrive by acquiring customers at artificially low “starter prices” and then ratcheting up rates over time. People, like spouses in soured relationships, tend to build up inertia. The perceived switching cost is just too much work, so you let hidden banking fees ding your account each month without taking action. Yet … it doesn’t have to be this way. Eventually, consumers realize they’ve been had, and they will move on if you abuse them. The smart business anticipates that consumers will someday wake up, and thus increases profits over time while adding additional value. So. How do you achieve nirvana — ongoing customer relationships and ever rising profits? The answer is to simply begin marketing to your existing account base. You certainly have a marketing plan to acquire customers, and you probably have loyalty programs in place to address those most at risk of defection. But what about the customers in the middle? Customers will never subscribe to your service unless you give them an explicit on-ramp. If you never ask, you will never receive. Do you promote subscription models? Do you reward repeat purchases or long tenure?